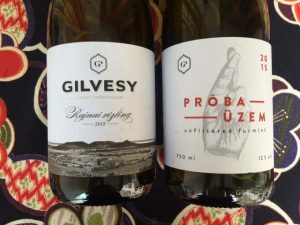 Szent György-hegy and Badacsony – no, I hadn’t heard about this region either before tasting these wines. But those northern shores of Lake Balaton, west of Budapest look dreamy on pictures. And the wines Robert Gilvesy sent me to taste had something special. While Sauvignon Blanc and a white blend were pleasant if on the light side (sandy soils? ), two other bottles really stood out. 2015 Rajnai Rizling (aka Riesling) from 40 years old vines seduced with intensely yellow fruit bordering on the tiniest, ripest, fragrant banana in the nose, and the sleek palate came as a (entirely pleasant) surprise. The discreet acidity led into a truly fascinating, spicy and smoky mineral finish, making for a wine you need and ought to listen to, as it refuses to shout. 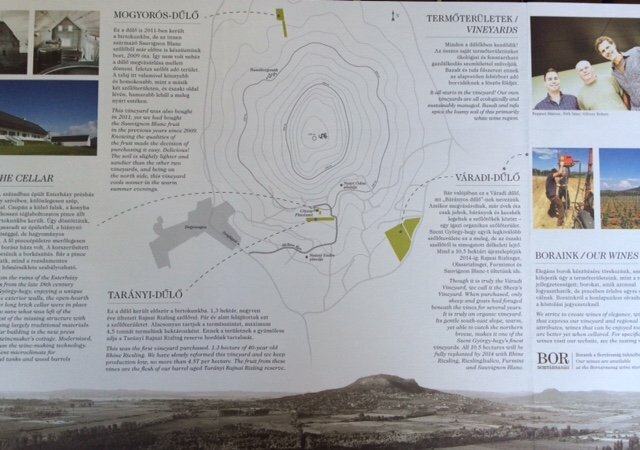 The 2015 Próba Üzem (Trial Run) Furmint has the drawing of a hand with crossed fingers on the label and you can just imagine Robert Gilvesy and his winemaker Márton Ruppert nervously begging the 500 liter barrel to please ferment a little further towards dryness… As it is the wild ferments left 5.3 grams residual sugar, which combine with 12 % alcohol to a delicious hint of honey and cream, again carried by that smoky, quiet minerality. Definitely a producer to watch – and hopefully visit at some point! A note on the importance of networks and moving freely in the world: these wines came to me (metaphorically speaking) via Canada. Robert is of Hungarian descent but grew up in Canada, my friend Arlene Stein is from Toronto but recently moved to Berlin.